So no, Silly-Head, not all potato gratins are the same… according to the French. 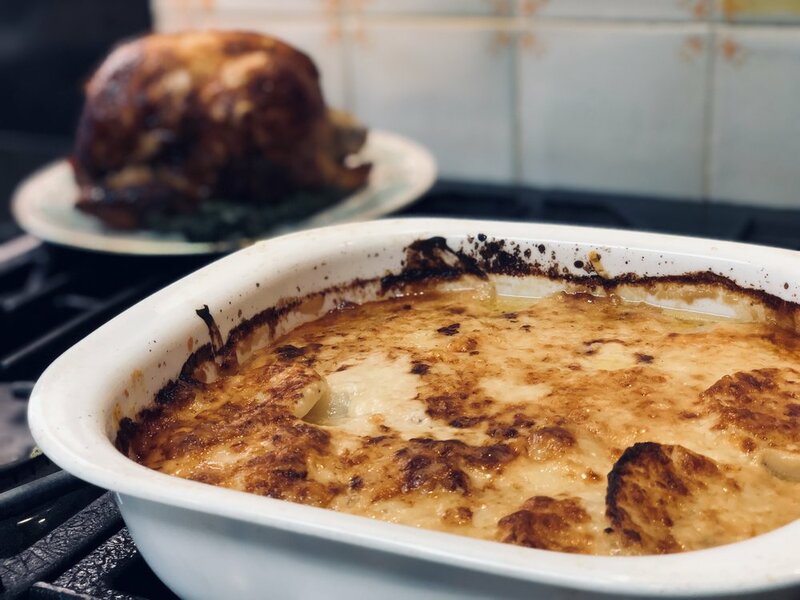 If you are a child of the seventies and eighties, and possibly up to the present day, your potatoes gratin or “scalloped potatoes” probably came from a box. Mine did, and I’m not mad at it. Having grown up and pursued the profession called “chef” (and a little time dining in cafes in Paris) my eyes were open to the wonders of the classic potatoes gratin. There are two “types” I would guess you could say. Potato Gratin Dauphinoise or potatoes thinly sliced and cooked in milk and cream with the perfect gratin caramelization on top, and the Savoyard version prepared basically the same way with the addition of cheese. Today we are going to make the Savoyard version, not only with two significant kinds of cheese but also with the addition of Pancetta bacon. Pancetta is not a prerequisite and can be easily substituted with bacon. Any meat at all is not required either. For the Savoyard, it is all about a one-pot-pre-cook and some delicious cheese. Wash and peel your potatoes, and leave soaking in a bowl of cold water to prevent oxidation (fancy word for browning). In a medium, large pot add cold milk and heavy cream. Set the two next teach other along with your cutting board, knife and kitchen towel. 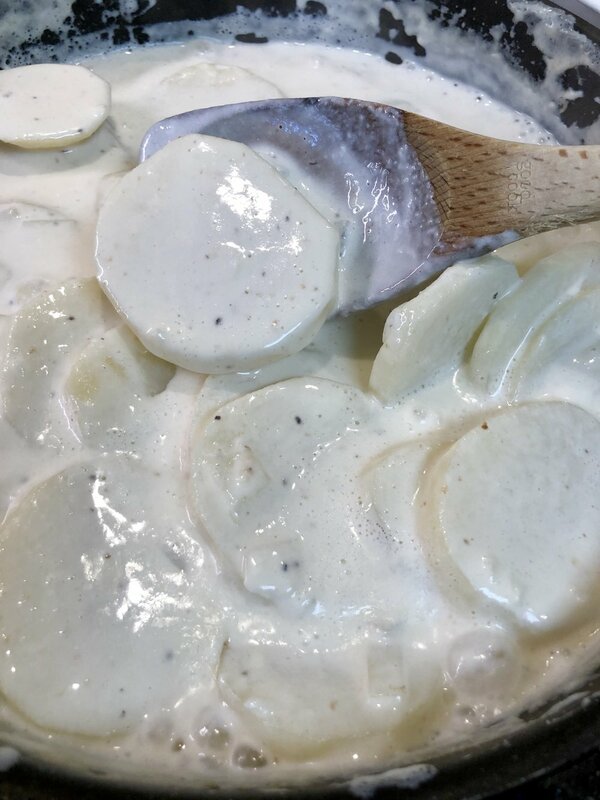 Place the sliced potatoes into the pot of milk and cream right away. Do this for all of the potatoes until they are all sliced and in the pot. To the pot add the diced onion and garlic. Add a pinch or two of “Cook’s Line Seasoning or salt, the nutmeg and pinch of cayenne which is optional; begin to heat gently. Remember milk will burn (scorch) on the bottom of the pot, and there is no recovery. Stir every once and a while and do not cook too hot/fast. Bring the milk and cream to a gentle boil and cook the potatoes anywhere from 10-15 minutes depending on the potato and how thick you sliced. Cook until the potatoes are knife tender. While that's going on, in a frying pan add a teaspoon or two of cooking oil. Add the sliced pancetta and start heating. Cook until the pancetta (or bacon) is somewhat crisp. Remove to a plate lined with paper towel to absorb any excess fat. Preheat your oven to 375 degrees. Once the potatoes are knife tender (cuts easily with the back of a knife), grab a slotted spoon and add a layer of the potatoes to a somewhat shallow casserole or baking dish. If you have a “gratin pan” then perfect! Add half of the potatoes. Layer on the fried pancetta to the first layer of potatoes. Next, layer on the last half of the potatoes. With a ladle, spoon in the milk mixture from the cooking pot into the baking dish. Ladle enough milk so that it comes halfway up in the dish. You don’t want the potatoes swimming in the milk and cream, just enough to keep the gratin wet while cooking. Finally, top the dish with the shredded cheese (combine the two in a bowl first. Forgot to mention that). Cover the entire dish with all of the cheese, making sure it hits all sides and corners. Place the dish into the oven and bake 50 minutes to an hour. Just long enough for the potatoes to get a nice browned cheesy top. Remove from the oven and allow the gratin to rest at least 30 minutes before serving. Serve as a side dish with any roasted/grilled meat or chicken. Enjoy!